Just 30 miles down the road from Lackland AFB, Schertz makes the perfect home for military members and their families. With stellar schools, dozens of local amenities and affordable real estate options all over, it’s got something for everyone – no matter what their age or interest. Built in 2000, this 1,200+ square foot home is located in the area’s lovely Lone Oak subdivision. At three bedrooms, two baths, it’s the perfect size for any growing family, and with tile throughout, it’s incredibly easy to care for and clean. The home features exposed wood beams, giving it a classic, rustic touch, while the open kitchen, complete with rich wood cabinetry and updated countertops, makes the perfect spot for entertaining. The backyard is expansive, offering plenty of space for a swing set, trampoline or, down the line, even a built-in pool. The big bonus? This home is listed at just $119,900. You won’t find a more affordable Schertz property than this one. This contemporary two-story home is nestled in a lavishly landscaped yard in the in-demand Arroyo Verde neighborhood. With lots of trees, foliage and shrubbery, along with a hidden-away side-entry garage, you’ll fall in love at first sight with this 5 bedroom, 3 bath property. On the inside, fresh paint, beautiful wood flooring, pristine tile and a spacious, open floor plan will have you in awe. But just wait for the kitchen. This gourmet eat-in boasts granite countertops, rich wood cabinetry, a breakfast room and a countertop bar. Stroll along the winding staircase, and you’ll find a stunning master suite complete with plantation shutters, a separate tub and bath and a walk-in closet. The yard is the true masterpiece though, offering a hot tub and tiered decking for entertaining. At only $294,900, this Schertz home is a steal in every sense of the word. Though the property was built in 1989, this majestic home has only had one owner – and that owner has cared for and loved the property every step of the way. With amazing upgrades, like new light fixtures, a brand new 30-year roof, updated ductwork and a frameless glass shower in the master, this property looks nearly just-built. The kitchen is a true stunner, complete with upgraded counters and backsplash, and the entire home boasts fresh paint, giving the property a welcoming feel from first glance. In the back, a covered patio and expansive yard make the perfect spot for entertaining, while the front’s historic oak trees give the place an elegant feel from the get-go. Looking for an affordable, spacious spot to lay your roots? At just under $200,000, this just may be the perfect place. Located on a spacious corner lot in The Park at Woodland Oaks, this stunning two-story property is truly a sight to be seen. With 4 bedrooms, 2 baths and more than 2,500 square feet, it offers just the right amount of space for a family of 3, 4 or even 5. Cooking will never get old in this classic eat-in kitchen, which offers an open floor plan, granite countertops and plenty of storage space. And if entertaining’s your thing, you’re in luck: Just head to the backyard, where you’ll find a sparkling lagoon pool, complete with built-in waterfall. Think a property of this caliber will empty your bank account? Think again. This stunner is only a mere $254,900. Now that’s value. With a gorgeous backyard, nearly 2,500 square feet of space and luxurious upgrades and amenities throughout, there’s more to this property than meets the eye. With 3 bedrooms, 2 baths and an expansive living area, it’s perfect for families of any size. Throughout the home, wood flooring, high ceilings and C-tile gave the home an elegant look, while the kitchen delivers the real punch. With recessed lighting, a ceiling pot rack and upgraded granite countertops, it’s a true sight to be seen. Upstairs, the split master offers the utmost privacy, and French doors give mom and dad easy access to the back yard. In the master bath, you’ll find a stunning walk-in shower, granite countertops and custom cabinetry, and out back, the expansive covered patio and hot tub are sure to impress. Want to tour any of these Schertz properties? 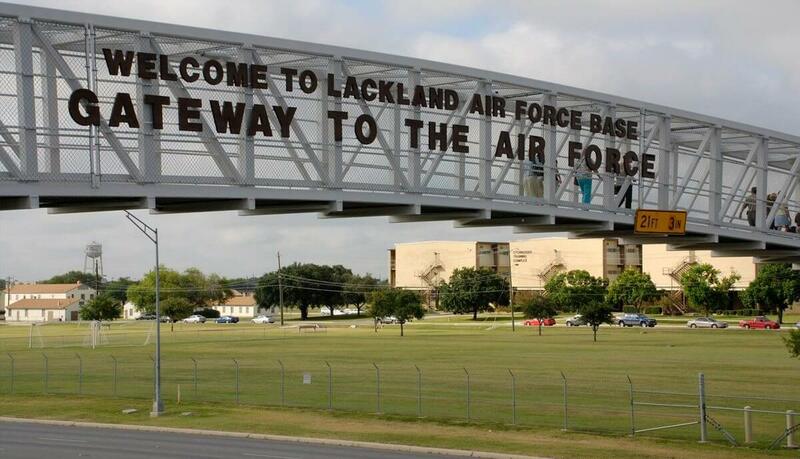 Need more help finding a home near Lackland AFB or any of San Antonio’s other military bases? Contact the Claus Team today. Our expert agents can match you with the perfect home for your needs, budget and preferences.